In 2011, I gave a talk at Holy Apostles Greek Orthodox Church in Westchester, Illinois, on the early history of Orthodoxy in Chicago. Here’s the text of that lecture, basically unedited since I wrote it 7+ years ago. The story of Orthodoxy in Chicago really begins in the 1880s. 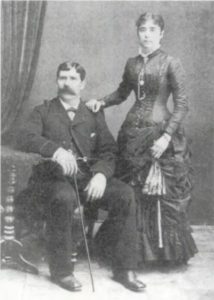 In 1885, a Greek couple, Peter and Georgia Pooley, moved to Chicago from Corfu. Georgia immediately organized a benevolent society of the Orthodox Christians in Chicago, regardless of ethnicity. The purpose of this society was to establish an Orthodox parish in the city. This marks the beginning of Orthodoxy in Chicago, in any sort of organized way. Fr. Misael was born in Bulgaria, though I’m not sure if he was actually Bulgarian, or if he was Greek. He came to New Orleans in 1881, and he remained there until his death 20 years later. He was a strange character – apparently he was an inventor, and at the time of his death he had been trying to build a flying machine. This was about two years before the Wright brothers invented the first airplane. Fr. Misael’s death was really tragic – in 1901, he learned that his father had died in Bulgaria, and at the same time, he was reportedly accused of… something. The old newspaper accounts make it sound like sexual misconduct, although at this point it’s almost impossible to know what actually happened. Anyway, in the wake of all this, Fr. Misael took a train to New York, checked into a hotel, ate dinner, went up to his room, and then shot himself in the chest. At the time of his death, he was the longest-tenured Orthodox parish priest in the Western Hemisphere. Anyway, back to our story… Around the time of that first liturgy in 1886, the a Montenegrin saloonkeeper named Krsto Gopcevic wrote a letter to the Russian ambassador in Washington, asking the Russian government to establish an Orthodox church in Chicago. The ambassador forwarded his letter on to the Russian Holy Synod, and in 1888, it reached Bishop Vladimir, the new bishop in San Francisco. In May of that year – May of 1888 – Bishop Vladimir replied to the letter, asking Gopcevic to organize a meeting of all the Orthodox in Chicago to see how many people were interested in starting a church. Vladimir planned to visit the city later in the year, and he wanted to know what to expect. The meeting was held on May 13. The Chicago Tribune sent a reporter to the event, and he wrote one of my favorite newspaper articles on early American Orthodoxy. It’s so good, in fact, that I’m going to share almost the entire thing verbatim. Mr. K.M. 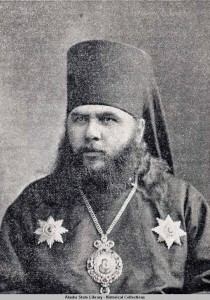 Gopchevich, a Montenegrin, with black hair and a light mustache, called the Greek Catholic meeting to order last night. All the Greek Catholics of Chicago were represented in the assembly. There were Athenians and Spartans, islanders of the Archipelago, sailors from the seaports of Asia Minor. And there were Slavs of all nationalities – Dalmatians from Ragusa and the Bocca al Cattaro; Servians from Prisrend and Belgrade; Bulgarians from Rustchuck. Only one Russian was in the hall, which was at No. 118 Fifth avenue; and he, feeling out of place, retired before the meeting was over. A small Greek in a pea-jacket, who might have been a pirate, but was really a dealer in coffee and spice, mounted the platform and discoursed with another Greek in hexameters and pentameters. He was so rapid in utterance, so excited in gesture, that a Servian at the end of the hall called him to order. The small Greek, who seemed to be on the point of drawing a knife to give point to his remarks, subsided in an instant, and his Servian conqueror demanded that hereafter the language of Thucydides should be discarded and that of Robert G. Ingersoll should be adopted. The Servian youths – the lads who had witnessed Prince Alexander’s overthrow – understood not a word of either speaker, but they mildly applauded their compatriot. Mr. Gobchevitch then drew from his pocket the letter which had occasioned the meeting. Time was when Mr. Gobchevitch had worn a yataghan at his side and a fez upon his head. Time was when Mr. Gobchevitch had looked along the barrel of a long rifle and had picked off Turks as they clambered over his native rocks. Time was when Mr. Gobchevitch, under the leadership of a soldier-priest, had scaled hills, had burnt villages, had hidden in caves, had rolled huge bowlders down upon the enemy. Mr. Gobchevitch went through every recent Montenegrin revolution; he has fought invaders like the sturdy mountaineer that he was; and today he keeps a saloon on West Twenty-second street, and is a modest, self-contained man, with a record that many an American General might envy. Mr. Gobchevitch then read the letter. It was written by Bishop Vladimir, who had lately arrived in San Francisco from Russia. The Bishop had conceived the project of establishing a Greek church in Chicago; and he suggested to Mr. Gobchevitch that all the Greeks, Servians, Bulgarians, and Russians in this city should sign a petition, which he would forward to the Holy Synod, and should raise funds to establish a church and pay a preacher. The signing of the petition was a task of much difficulty. Some of the Greeks had names like Nicolaos Kristolambros and Dimitri Korphiatis, and they spent as much time in spelling them out as though they were writing a book of the Iliad. Others signed for the whole family, as Pietros Poulos, George Poulos, Jans Poulos. Others could not sign at all and their names were affixed by the zealous Mr. Gobchevitch. Among the latter was a handsome but diminutive youth with a rose at his button-hole and thick black hair plastered over his forehead. He was the latest arrival from Athens, where he was considered quite an Adonis. What had he to tell of Athens? He knew many pretty women there. Had he ever been to Marathon? He had never heard of Marathon. What did he think of the Parthenon? He had never heard of the Parthenon. Had he read Sophocles or Euripides? He could not read or write. But he was quite a fashionable youth in modern Athens. So the petition was signed at last, and then the older men gathered round the platform and told of old Greek liberty. From other newspapers, we know that there were roughly a thousand Orthodox living in Chicago at the time – about 600 Greeks and 400 Slavs, which included Serbs, Montenegrins, Bulgarians, Russians, and so forth. About a hundred men attended the meeting – and it would have been nearly all men, because there were hardly any Orthodox women in Chicago at the time. George Brown, the Greek veteran of the Civil War, was elected chairman, and the Montenegrin Gopcevic was chosen as secretary. One newspaper, the Inter Ocean, reported that the assembly discussed the issue of language – with Orthodox of different ethnicities, what language would they use in the services? They decided that they’d leave the final decision to the Russian authorities, since, presumably, they would be the ones footing the bill for a building and a priest, although there was discussion of alternating Greek on one Sunday and Slavonic on the next. 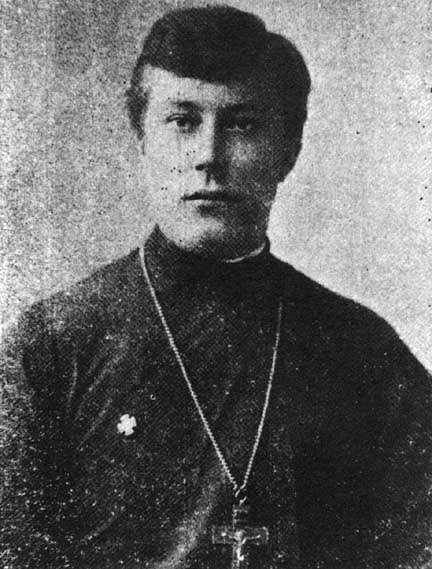 Bishop Vladimir Sokolovsky visited Chicago in 1888 and again in 1891. In October of 1888, Bishop Vladimir visited Chicago; unfortunately, though, this didn’t lead to the establishment of a parish. I’ve seen this early Chicago community described as a sort of “proto-parish,” and that’s a pretty good description. In 1891 there was another meeting, led by three Greeks, three Russians, and three Serbs. 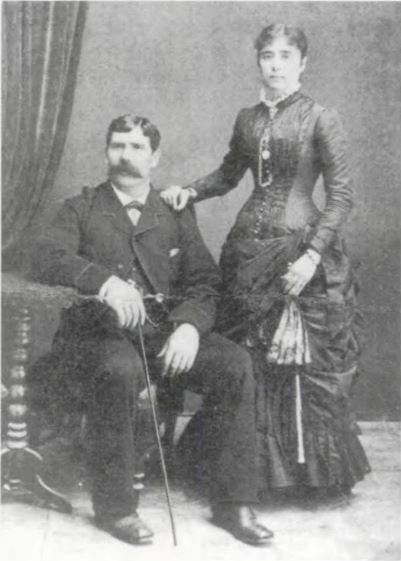 Their hope was to start a parish in time for the 1893 Chicago World’s Fair. A Greek priest from San Francisco came for a visit and celebrated the Divine Liturgy. This priest, Fr. Kallinikos Kanellas, had come to America from India, where he had been the priest of the Greek church in Calcutta. Although he was Greek, he was affiliated with the Russian cathedral in San Francisco. George Brown, the Greek veteran of the Civil War, told a newspaper that the Chicago Orthodox were working with the Russian Church and had been promised their own priest as soon as they built a church. This seems like an odd approach, requiring the laity to build a church before sending a priest. But no building was ever erected, and no priest was sent. At exactly this time – 1888 to 1891 – Bishop Vladimir was embroiled in a series of horrible scandals at his cathedral in San Francisco. Early on, his cathedral was burned to the ground (and some whispered that it was arson). 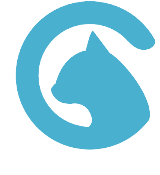 Rumors swirled that funds had been embezzled. The accusations against Vladimir himself were the worst — he was charged by his detractors with sexually assaulting numerous young boys. To this day, it’s not clear whether these accusations were true or false – whether Vladimir was a monster, or an innocent victim of slander. I mentioned a moment ago that one of the leaders of the early Chicago community was a Montenegrin named Krsto Gopcevic. Well, Gopcevic had relatives in San Francisco, and one of them was a sworn enemy of Bishop Vladimir. The Chicago Orthodox heard regular reports of the trouble in San Francisco, and they decided that they wanted nothing more to do with the Russian bishop. So they started looking at other options. Gopcevic wrote to Serbia, and others wrote to Constantinople and Athens. The Russian Church finally replaced Bishop Vladimir in early 1892, and in March of that year, the new Russian bishop, Nicholas, passed through Chicago on his way to San Francisco. He met with some of the leading Greeks and Montenegrins, and there was again talk of starting a multiethnic parish. But it didn’t happen: Just a month later, in April 1892, a priest arrived from the Church of Greece, in response to an earlier appeal to the Archbishop of Athens. The priest’s name was Fr. Panagiotis Phiambolis, and he established Annunciation, the second exclusively Greek parish in America, just behind Annunciation in New York, which had been formed two months earlier. Anyway, just a month later, in April 1892, Bishop Nicholas sent Fr. Ambrose Vretta to Chicago to start a church under the Russians. For the first time in American history, two Orthodox churches answering to different bishops coexisted in the same city. The Greek church was, as I said, exclusively Greek. The Russian church actually didn’t have a whole lot of Russians, to begin with: there were Slavs from the Austro-Hungarian Empire, plus lots of Serbs and Montenegrins, and a handful of prominent Russians. The first priest of that Russian church, Fr. Ambrose Vretta, was not a Russian himself. Contemporary sources refer to him as being from Macedonia. He went to medical school in Constantinople, then studied in Rome, and ended up in Russia because he wanted to avoid the Turks. In Russia, he became a priest, and he was sent to America with Bishop Nicholas in 1892. So in a span of about a month, Chicago went from having no Orthodox parishes to having two. And for a short time that year, they had a third. In response to a request from the Montenegrin Gopcevic, the Metropolitan of Belgrade sent Fr. Firmilian Drazic to Chicago to start a Serbian church. Fr. Firmilian arrived just in time for the Fourth of July. To celebrate, he took the thanksgiving service for Serbian independence and replaced all the references to Serbia with “America.” Basically, he improvised hymns and prayers in commemoration of American independence. The Serbian community wasn’t ready to support its own parish, and after about six months, Fr. 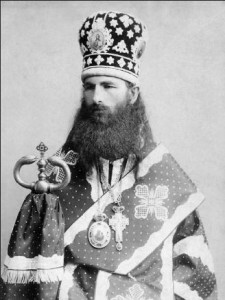 Firmilian returned to Serbia, where he went on to become a bishop. When he left the country, Fr. Firmilian gave Chicago Serbs a set of vestments and holy vessels. The Serbs attended the Russian church until 1905, when they founded their own parish and were able to use the items given to them by Fr. Firmilian back in 1892. The following year, 1893, Chicago hosted the World’s Fair. The Russians had a big exhibit, complete with its own Orthodox chapel, and all the ethnic groups participated in the “Parade of Nations.” In conjunction with the Fair, a remarkable event was held, called the “Parliament of Religions.” Besides attracting representatives from every imaginable Christian denomination, there were Jews, Muslims, Hindus, Buddhists, and practically every other religion under the sun. 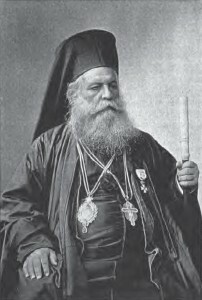 Several Orthodox clergy participated, including the first Greek bishop to ever set foot in America – Archbishop Dionysius Latas, from the Greek island of Zakynthos. In his day, Archbishop Dionysius was one of the best-known and most eloquent hierarchs in the Church of Greece. His first stop was New York, where he preached in the city’s tiny Greek parish. At the invitation of an Episcopalian bishop, he visited the resort town of Saratoga Springs before traveling to Washington in an effort to meet President Grover Cleveland. The President was out of town, but the Archbishop made a strong impression on the newspaper reporters of the nation’s capital. This was the beginning of a pattern – everywhere he went, Archbishop Dionysius was an immediate favorite of the newspaper reporters. He was one of the most colorful figures they had ever seen, with flowing robes, a big beard, and a keen sense of humor. He joked to one reporter, “Americans and Englishmen are different. The Englishman is like this,” he said, drawing in his head and putting on what the reporter called “a stiff, gloomy, and morose expression, which was comical in the extreme.” Dionysius continued, “But the American is always this way,” and he burst into a hearty laugh. The Archbishop finally made it to Chicago, and he was one of the most prominent figures in the unusual “Parliament.” Afterwards, he remained in the United States as the guest of various Episcopalian hierarchs. He traveled to Boston, St. Louis, back to Chicago, and then to San Francisco. At an Episcopal Church conference, Archbishop Dionysius argued that Anglicanism was the best platform for the unity of Christendom – a view common among Episcopalians, but rather remarkable for an Orthodox bishop. On his way back to Greece, Archbishop Dionysius went across the Pacific, rather than the Atlantic. He stopped in India, where he spoke at a local Methodist convention. After a year away from home, he finally returned to Zakynthos in mid-1894. He died very soon afterwards, at the age of 58. Archbishop Dionysius wasn’t the only Orthodox clergyman at the Parliament of Religions. The Russian bishop, Nicholas, declined to participate, but an Antiochian named Fr. Christopher Jabara jumped at the chance. Jabara, who was one of the first Antiochian priests to visit America, was a rather erratic personality. He had come up with the idea that Christianity needed to abandon the doctrine of the Holy Trinity and merge with Islam, paving the way for a single world religion. To be completely frank, the Orthodox thought he was nuts, and in New York, the Antiochians ran him out of town despite their strong desire for a priest. Jabara gave a speech at the Chicago Parliament of Religions, and then went to Boston, where he was warmly received by the Unitarians. He left the country soon afterwards, and for all intents and purposes he left the Orthodox Church as well. Meanwhile, in Chicago, while the Orthodox community had divided along ethnic lines, it was an amicable division, with no hard feelings on either side. In the early years, the Greek and Russian priests and their congregations were on very good terms with each other, and joint events were reasonably common. In October of 1894, the two parishes held joint services at the Russian church to commemorate the hundredth anniversary of the Russian mission to Alaska. Delegations came from other cities, including the new Russian church in Streator, Illinois, and after the service all the Orthodox had a big procession to Jefferson Park, where they held a blessing of waters service. A month later, the Russian tsar died, and the two congregations held a joint memorial at the Greek church, which was simultaneously dedicating its new building. The Russian bishop Nicholas visited Chicago in December 1894, and the Greeks and their priest participated in the hierarchical services. Both the Russian and Greek choirs sang, and Fr. Vretta translated Bishop Nicholas’ sermon into Greek. Unfortunately, Fr. Vretta had a drinking problem, and in 1895 he was replaced by a newly-ordained, 24-year-old Fr. John Kochurov. This ushered in an era of great progress for the Russian church in Chicago. Hundreds of former Eastern Rite Catholics converted to Orthodoxy during Kochurov’s Chicago career, and in 1903, construction was completed on Holy Trinity Cathedral, which of course remains one of the most distinctive Orthodox temples in America. Kochurov was also one of the best examples of the circuit-riding American Orthodox priest, who was responsible, not only for his own parish, but for large parts of the country that didn’t have an Orthodox church. During Kochurov’s tenure in Chicago, the ties between the Greek and Russian communities remained strong, with continued joint services. Another example of cooperation is the search for the Russian church bell in 1902. It’s a story interesting enough to retell here. The quarter-ton bell of Chicago’s Russian church was originally a part of the Russian exhibit at the World’s Fair. At the time, the church building was too small to house the bell, so it sat in storage for nearly a decade. By 1902, construction on Holy Trinity Cathedral was underway, and a special belfry was designed for the bell. But on an early May morning, three men broke into the storage area, rolled the bell into an alley, hoisted it onto a wagon, and took off. The Russian congregation was up in arms, and the next day, a huge general meeting was held, with seventy percent of the Orthodox of Chicago in attendance. Fr. Kochurov begged everyone for their help, and all went off in search of the bell. I’m afraid I don’t know what the outcome was – whether they ever found the bell, or caught the thieves – but this incident shows that the Orthodox community of Chicago remained cohesive a decade after dividing into ethnic parishes. I can’t end this lecture without at least briefly talking about the Greek church split of 1897. This is definitely not an easy topic to cover, in large part because issues surrounding that split are still points of contention today, 114 years later. And I’m an outsider – I’m not Greek, I’m not from Chicago, and while I’ve researched the subject, I’m no expert on the 1897 split and its aftermath. My sources, primarily, are the newspapers of the time period – mainly the Chicago Tribune and the Inter-Ocean. So with that disclaimer out of the way, let’s try to piece together what happened. In early February of 1897, war erupted between Greece and Turkey. In Chicago, Fr. Phiambolis led the local Greeks in swearing an oath of allegiance to King George. Greek men left Chicago by the hundreds, all returning to fight for Greece. Fr. Phiambolis was very prominent in his support of the war effort, but that wasn’t enough for some of his parishioners. He was asked to devote $700 of church funds to pay for equipment and transportation for the returning soldiers. Phiambolis declined. If it sounds like Fr. Phaimbolis was being cheap, keep in mind that in 1897, $700 was a small fortune. To give you an idea… 20 years later, the average salary of a Greek parish priest in America was just $913. And that was 20 years later. Seven hundred dollars in 1897 would have been a huge percentage of the parish budget, and it may have been more than Phiambolis himself was making for the entire year. Regardless of all that, some of Phiambolis’ parishioners claimed that he was cheap, and worse than that – that he didn’t care enough about Greece. Really, all this seems to have just been an excuse. According to most sources, the division in Chicago was between Greeks from Sparta and Greeks from Arcadia. For various reasons, the Arcadians wanted Fr. Phiambolis out, and when they reached Athens, they complained to the Archbishop that Fr. Phiambolis was unpatriotic and should be replaced. The details are sketchy, but it appears that the Archbishop was convinced, and he sent Fr. Theodore Papaconstantine to replace Fr. Phiambolis in August. As soon as Fr. Papaconstantine arrived in Chicago, the Greek community was thrown into turmoil. Both went to the police: Fr. Phiambolis claimed the support of the majority of the Greek community, while Fr. Papaconstantine showed everyone the documents from the Archbishop of Athens appointing him to Chicago. While I think Fr. Phiambolis was being treated unfairly, his views represent a rather troublesome ecclesiological shift that took place in early American Orthodoxy. With no bishop nearby, and with laypeople responsible for organizing parishes, an enormous amount of power fell into the hands of the parish boards of trustees. Parishes were independently incorporated, and all their property was owned by the corporation. Boards had the legal authority to hire and fire priests, almost at will. This incident in Chicago was one of the first times that the power of lay boards was openly asserted. Anyway, in the end, Fr. Papaconstantine failed to take control of Annunciation. In October of 1897, he established Chicago’s second Greek parish – Holy Trinity. Fr. Phiambolis continued to lead Annunciation until 1899, when he moved to Boston. This is where things get tricky. I know that many in Chicago contend that the original parish of Annunciation dissolved in 1899, and that the present Annunciation was founded several years later. Others, from what I’ve been told, say that the present Annunciation is the original – that the current Annunciation parish is the same one that was led by Fr. Phiambolis in the 1890s. As for me, I honestly have no idea which of these positions is right. The first Greek Orthodox parish in Chicago was definitely Annunciation, and unless there’s evidence that Annunciation continued without a priest in the early 1900s, the oldest surviving parish appears to be Holy Trinity. This is one of those gray areas of history that doesn’t have a clear answer, a clear “right” and “wrong.” And it’s an area ripe for further research, for anyone who is interested. In any case, we’ve reached the end of this narrative of the very early history of Orthodoxy in Chicago. One of the most striking things about Chicago’s Orthodox history – all the way up to the present day, actually – is its diversity. The first Divine Liturgy in Chicago was celebrated by a priest born in Bulgaria. The first organized Orthodox community consisted of Greeks, Serbs, and Montenegrins. The Russians quickly took a prominent role, and a canonized saint led the Russian parish in Chicago for more than a decade. And the Russian church membership came to be dominated, not by your typical Russian, but by Carpatho-Rusyn converts from Eastern Catholicism. And all that is just the tip of the iceberg – among others, I haven’t even mentioned my own group, the Antiochians. All of these groups, and more, have played crucial roles in shaping Orthodox life in Chicago. They made Chicago into one of the earliest centers for American Orthodoxy, and while they eventually did divide into ethnic parishes, they retained their common Orthodox identity. That common identity survives today, in spite of a century of jurisdictional division. The next great event in Chicago’s Orthodox history will take place in two months, when our North American Assembly of Bishops will meet in Chicago and work to unite us all into a single American Orthodox Church. It’s fitting that the bishops will meet in Chicago, where the earliest Orthodox residents understood that for Orthodox Christians to survive in America, we need each other. They needed – and we still need – to work together across ethnic and jurisdictional lines to build up Orthodoxy in our local communities. I’d like to close with the words of George Brown, the early Greek leader of Chicago’s Orthodox community. “Union is the strength. Let everybody make his mind and have no jealousy. Our religion is one. We will surprise the Americans. Let us stick like brothers.” Thank you.